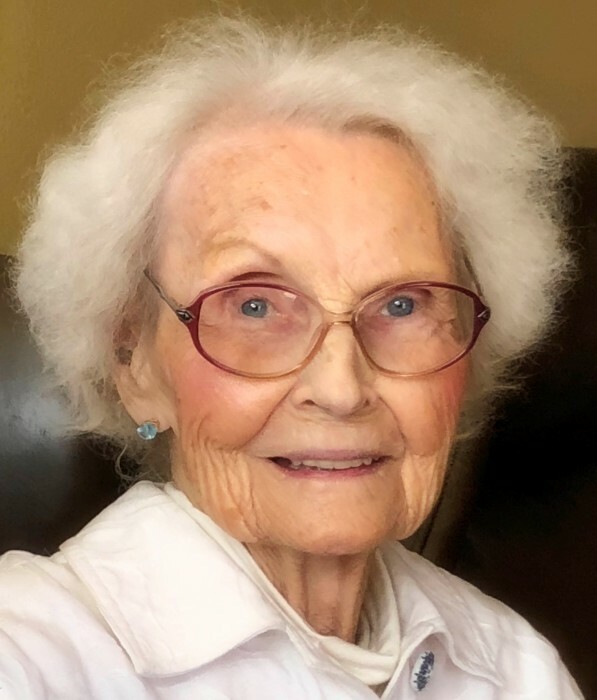 Obituary for Sadie Loraine (Nelson) Thompson | Allen Brothers Mortuary, Inc.
Sadie Loraine (Nelson) Thompson, 96, of San Marcos, California, passed away on November 12, 2018, in her home. A Memorial Service will be held at 11:30 A.M. on Saturday, December 8, 2018, at San Marcos Lutheran Church located at 3419 Grand Ave, San Marcos, CA 92078. Pastor Karla Halvorson will be officiating. Inurnment will follow in the church at the columbarium wall. Sadie was born in the Volga, South Dakota hospital to Albert G. and Sena C. Nelson on April 8, 1922, and was the youngest of the ten surviving siblings. She went to school in Volga. Sadie married the love of her life, Lloyd S. Thompson on March 10, 1943, in the Volga Lutheran Church. At the time, Lloyd was a 2nd Lieutenant in the United States Air Corps. During her lifetime, she worked as a bookkeeper for Geo. P. Sexauer & Sons in Brookings, South Dakota; as a secretary for a division within the United States Engineers in Mobile, Alabama, and as a loan secretary for a bank in Beaverton, Oregon. She was always deeply involved in church activities, especially choir, and was a church council member in her Beaverton church. Sadie was a lifelong member of P.E.O. International. She loved to golf, ski, play bridge, entertain, travel, and led an active social life. As a golfer, she was competitive and credited with three holes-in-one! Sadie is preceded in death by Lloyd (her husband for 70 marvelous years); her siblings Mabel (age 3), Angie, Arne, Edith, Eleanor, Esther, Gladys, Hartman, Mabel, & Mildred, and her parents Sena & Albert Nelson. Sadie is survived by her daughter, Susan Thompson of Las Vegas, NV; son, James Thompson & wife Kathy, of Roseville, CA; and son, Jeffrey Thompson & wife Paula Rees, of Seattle, WA. Surviving grandchildren are Tina Thompson-Arce, Carl Thompson, and Petra Townsend. Surviving great-grandchildren are Hailey, Coby, & Lexxi Thompson, and Tatum Townsend. Memorials may be donated to San Marcos Lutheran Church and/or the P.E.O. Sisterhood. The family wishes to extend our sincere appreciation to the dedicated and compassionate caregivers and staff of Aall Care, The Meridian at Lake San Marcos, and The Elizabeth Hospice.